Once a week or so I receive a message on Etsy asking me to explain how to download a purchased .ZIP file. 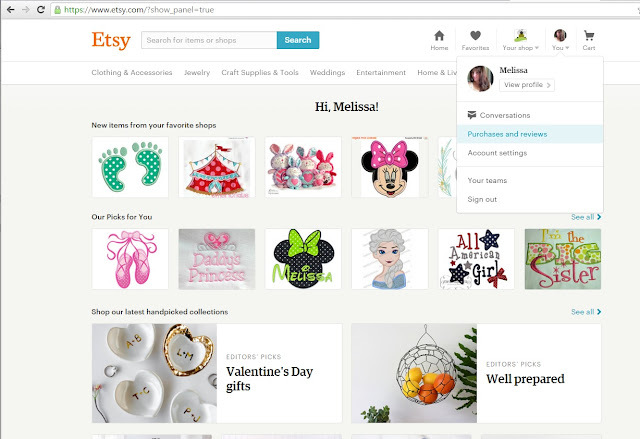 As you can imagine, it becomes very time-consuming to respond to every message and share my screencaps, so I’ve made this handy step-by-step tutorial on how to download your digital purchases from Etsy. If I’ve directed you here from my Etsy site, welcome! Thank you for your purchase from my shop. 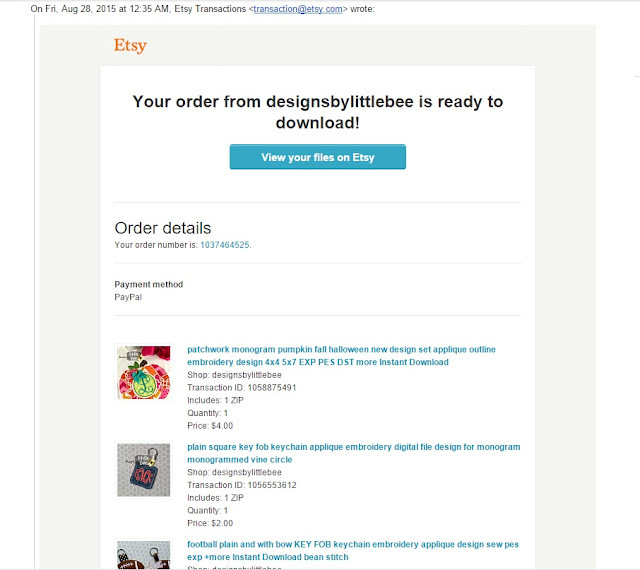 When you make any purchase on Etsy, you will receive a confirmation to the email on file in your account that says, “Congrats! You’ve bought something awesome from so-and-so!” or whatever. For digital files, there is a big button that says “View your files on Etsy” and will take you right to the page to download your files. Here is one from one of my customers showing her what she purchased from me (the monogram circle pumpkin, a monogram square key fob, and a football key fob). But let’s say your email address was not up to date, or you deleted it by mistake, or you just never saw it come through. Let’s go right to Etsy.com to download your files. First, don’t try to download your .ZIP files onto a cell phone or a tablet. Maybe you can download a file on them, but I don’t think you can open an embroidery file on it. I may be wrong. So make sure you’re on a laptop or desktop and log in to your Etsy account. At the top of the page, to the right, there’s a little icon that says “You.” Mine has a picture of me because that’s how I set it up in my account. As the title, gave away, on this page you will see a recap of your purchases. This is also where you can leave reviews on the desktop site for items that really blew you away! 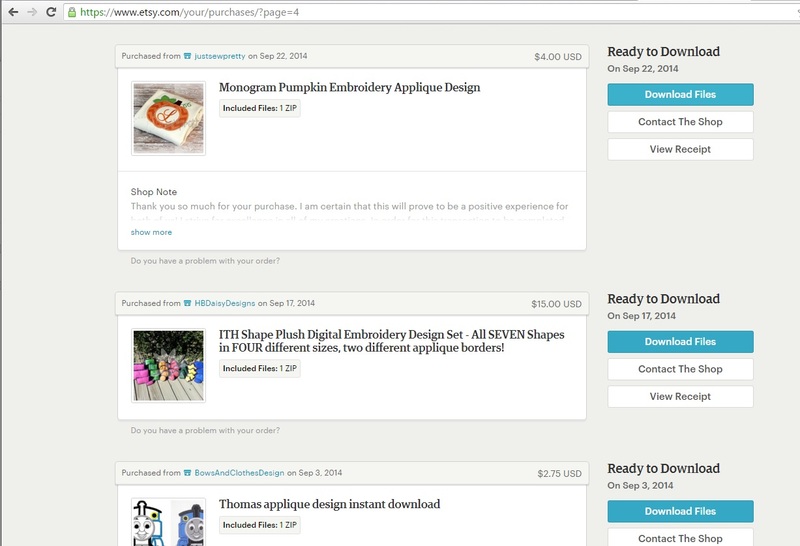 For physical items that you purchased (I didn’t get any on this particular screencap but I do buy from small businesses on Etsy OFTEN! ), here is where you can view your receipt, see a due or ship-by date, and see the tracking information if it’s been sent. For your digital purchases, you see the blue button that says “Download Files”? Click that and your computer will react however you’ve told it to when you download a file from a website. That’s it! Now you’re the proud owner of a new digital .ZIP file. If you need to know how to open up items in a .ZIP file, you can follow this tutorial further by going here. Hope this has cleared up any questions you may have and you are stitching up new beautiful creations in no time!